The Panola College Choir and the Panola Pipers performed in concert at 7 p.m., Thursday, Oct. 18, in the Q.M. Martin Auditorium. Sandra Bauer, professor of vocal music, directed the choir. Ginger Cook, pianist, accompanied the singers. The program opened with “Look at the World,” a song that was part of the program with the Shreveport Symphony. Soloists were Ellie Cawthon and Davy Cawthon, singers with the Pride of Panola Elementary Honor Choir. 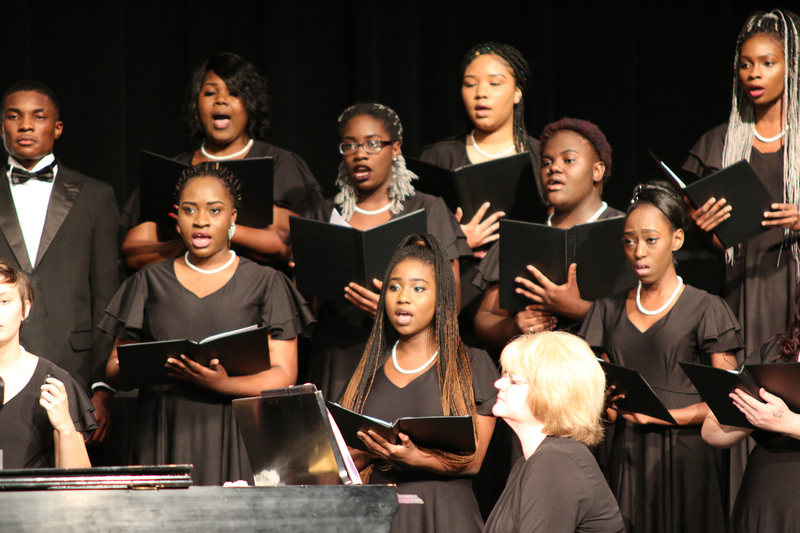 Next, the choir performed “Mojuba,” a Nigerian folk song featuring solist Lucy Eke, and James Lilly, Destiney Miller, Carrie Lilly, Whitney Ramsey, and Savana Hanaway on percussion. Next, the choir performed “Laudamus” featuring James Lilly and Carrie Lilly on percussion, followed by “O Clap Your Hands.” Wrapping up the choir’s portion of the program was “He Never Failed Me Yet,” featuring soloist Hunter Moon, and on percussion, James Lilly. The Panola Pipers took the stage next, opening with “Something Just Like This,” featuring soloist Aaron Tello. Kacia Johnson was the soloist for “Scars to Your Beautiful.” Soloists for “Meant to Be” were Aaron Tello, Emma Harden and Hunter Moon.” The final number on the Pipers’ program was “Tell Your Heart to Beat Again,” featuring soloists Hunter Moon and Sydnee Taylor. The Panola Pipers are Toluwani Ayodele, Nigeria; Latiffannie Gardner, Center; Pamela Painter, Marshall; Aaron Tello, Center; Emma Harden, Bullard; Michaela Garrett, Center; Kacia Johnson, Tatum; Sydnee Taylor, Carthage; Hunter Moon, Beckville; Mia Sartor, Carthage and Joy Jekayinoluwa, Nigeria.